Pressed cement screed as a product of interior and exterior decoration for walls and floors, of objects and furniture, has won the admiration of architects and interior designers. However, it has also won the hearts of owners and guests of hotels, shops, restaurants, of catering and recreation facilities in general. 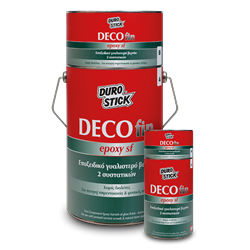 The necessity to create styled surfaces (floors and walls), even for the most demanding applications, on surfaces and areas where the application of pressed cement screed was not possible, was the trigger for the creation of DUROSTICK DS-252 FLEX. This product is now known for its characteristic flexibility and high strength. Floors with radiant heating systems, walls and floors subjected to vibrations, lofts and plywood flooring in general, and even (thoroughly cleaned) sheet metal, after its coating with DUROSTICK DS-260 or DS-255 quartz primer, are just some of the many applications that the flexible pressed cement screed DS-252 FLEX can handle successfully. Its flexibility, in combination with its strong adhesion, allows for an extended range of applications for this product. Thus making it a solution to new construction projects, as well as for reconstructions and renovations of places where existing cement screeds, mosaic floors, existing tiles, marble etc. are present, when they have been properly prepared for achieving the exceptional results the product is capable of. A wide range of applications, on a variety of substrates, after their proper preparation. Remains unaffected from small vibrations, expansions, and contractions of the coated surfaces. High mechanical strengths of the finish, top surface. Advanced formula that does not require any kind of improving additive. Offers results of exceptional decorative value, inspired by the tradition Greek architecture. 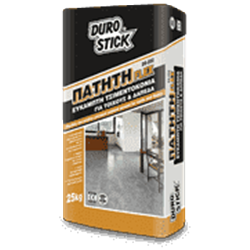 DUROSTICK DS-252 FLEX pressed cement screed is available, ready mixed, in white and 7 additional colors. 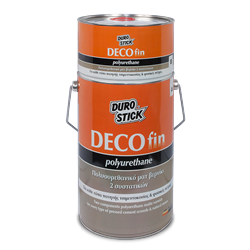 You can also create your own unique styles using DUROCOLOR POWDER-C of DUROSTICK, available in 96 colors, and DUROCOLOR, the measuring system for shade rendering, in 20ml syringe packaging.